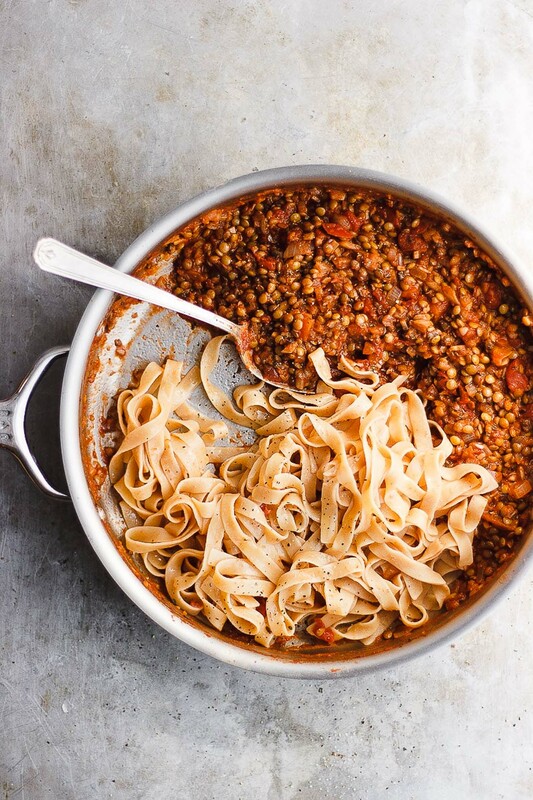 A hearty lentil bolognese sauce that's full of flavor. 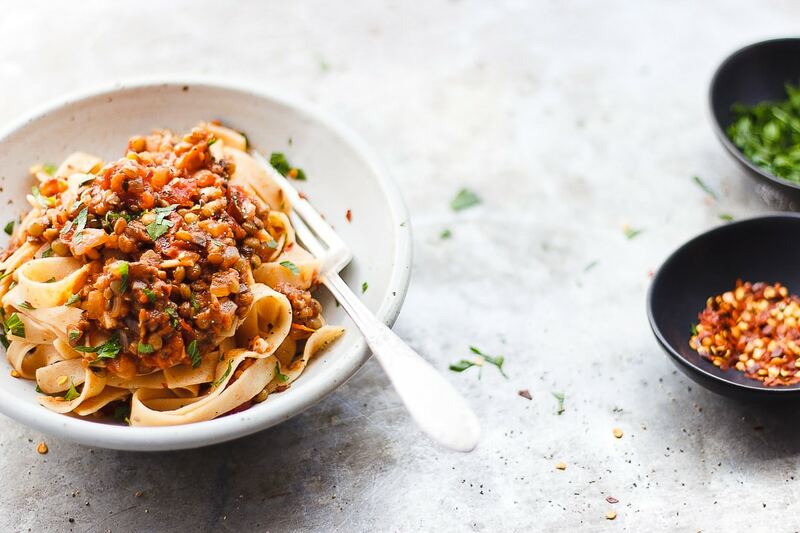 A vegan Bolognese sauce that is paired with gluten-free tagliatelle. My family may disown me for this one. And my mother-in-law lives in Bologna. And when I visit (despite my mostly plant-based lifestyle) I manage to eat my fair share of ragù. Typically, Americans call ragù, meat sauce. The two are meant to be the same thing, but they aren’t. Traditional ragù is mainly meat, with just a tiny touch of tomato. The Bolognese sauce most people are familiar with is generally characterized as being a red sauce with meat in it. 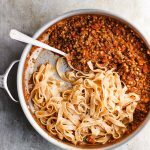 This mushroom lentil Bolognese sauce doesn’t actually contain either of the defining characteristics of a traditional ragù, but it does have a wonderful texture consistent with the meat sauce most of us know. And that counts for a lot. I’ve been wanting to put a vegan Bolognese sauce on my blog for years. But I’ve always been too nervous to know what my Bolognese family might think. They’re quite judgmental. And by that I mean they’re very particular about their food and Italian culture. As they should be. 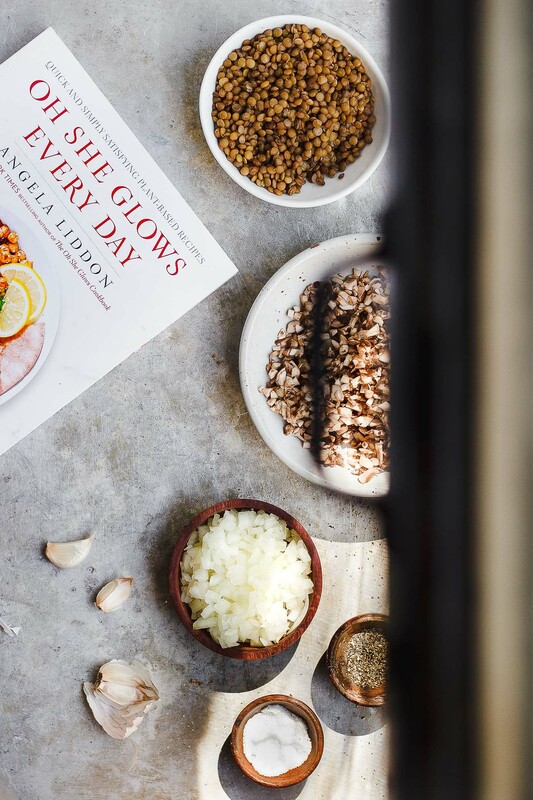 When Angela’s new book, Oh She Glows Every Day arrived on my doorstep containing a hearty vegan Bolognese recipe inside, I was like, yeah now is the time. Because I can count on Angela. She is the queen of plant-based blogging, after all. A few things about the tagliatelle bolognese recipe! It contains mushrooms. A secret about me, I really dislike mushrooms. You won’t find a single recipe on my website that uses them, until now. I’m sorry, mushroom lovers. I’ve tried and tried but I just can’t get into them, until now. 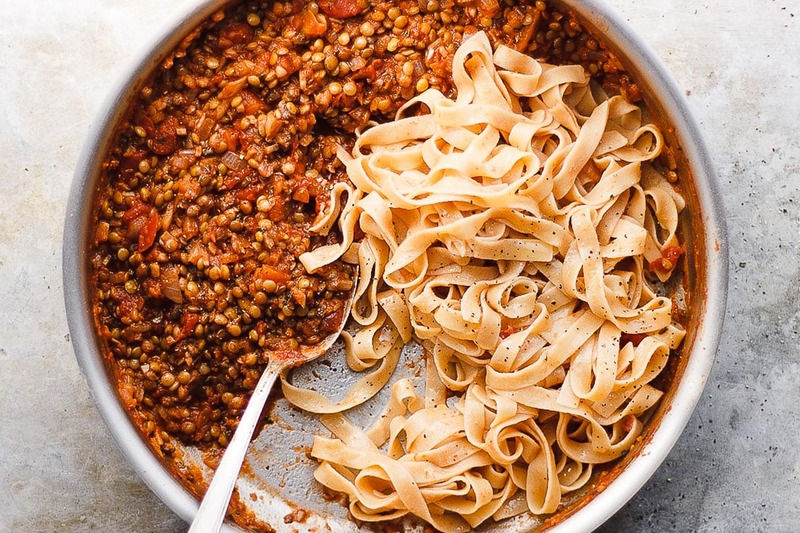 They make this lentil Bolognese sauce texture just right. Plant-based protein like lentils (used here) gives it a good base layer, but it needs another component to build the right mouth feel. And minced mushrooms does just that. And although Angela’s recipe has a twist of tahini in it, which sounds like it’d provide some wonderful nutty undertones, I chose to forgo it keeping the sauce as authentic as possible. A few things about this book. It is new, and it is fantastic. Oh She Glows Every Day is a hearty collection of simple, straight-forward staples for any anyone living a plant-based life. And I’m giving one away to one of you. Leave me a comment below—what vegetable is hard for you to get behind? Or do you love them all? I will choose a winner at random on September 19 at noon Central, and notify them by email. Sorry folks, the book will be sent to a United States shipping address only. Lightly adapted from Oh She Glows Every Day. I am using crushed tomatoes from a can that are unsalted and unseasoned. I chose gluten-free tagliatelle for the pasta, but you can use any kind of pasta you'd like, gluten-free or not. Bring a large pot of water to a boil for the pasta. Cook pasta according to the box instructions, drain and set aside until the sauce is ready. In a large sauce pot heat the olive oil over low heat and add in the onion and garlic. Cook for 5 minutes, stirring occasionally. Add in the mushrooms, season with a pinch of salt and pepper and cook for another 3 minutes. Add the spices and crushed tomatoes and stir. Bring the mixture to a simmer and add in the lentils. Simmer for another minute or two and remove from the heat and portion over pasta. Serve hot with a sprinkle of crushed red pepper, parsley and parm if you desire. Thanks to the folks at Avery Publishing for gifting me an advance copy of Oh She Glows Every Day! It’s hard for me to think of a veg I don’t love! I don’t like celery in juice or smoothies if that counts! I’m not a fan of raw anise or celery. I just can’t do beets. I tried juicing with theme but if I want a purple veggie I will stick with red cabbage. No borscht for this girl! Broccoli – I wish I could! It’s hard to like bitter melon for me. I tried many ways to love, but all have failed…so far. Arugula is a difficult one for me. I can’t stand eggplant as hard as I try. It comes in my CSA produce share every summer. Since I had a CSA for a few years, I’ve learned to love a lot of veggies I didn’t before. Like radish, turnip, and even beets – which I can’t imagine not liking now! Slimmy okra, however I have learned to prepare it (slimeless) and its delish. A vegetable I am not found of? Perhaps, radishes. Especially radish sprouts! One time I thought I bought pea sprouts and yeah, found that out the hard way. There are still lots of vegetables I haven’t tried (the more unusual ones like kohlrabi and rutabaga) so I don’t know if I’ll like those or not. Otherwise I’ve loved all the veggies I’ve eaten so far! Green beans. I guess it’s the little kid inside me, but whenever I’m presented with green beans I can’t make myself eat them! This looks amazing! Beautiful pics. I love lentils and love how mushrooms add a meaty flavor to sauces and stews. I follow Oh She Glows in instagram and drool over her food…this book is on my holiday list! The vegetable I can’t love is eggplant. I want to, I’ve made things with it, I’m extremely intrigued by it’s purply gorgeousness at farmers markets, but it just creeps me out. Very glad to see I’m not the only one! Do beets count as a vegetable? I just can’t do beets. I think your family would be proud of this ragu, it’s beyond stunning!!! I used to hate mushrooms until I was probably 19. Lol, my parents even paid me to eat them as a child. Can’t get behind slimy okra. Nope. So far, I have not met a vegetable that I don’t like! I’m looking forward to trying this recipe – looks amazing! I’m not a big fan of root vegetables, except for potatoes. I love every single one that I have ever tried…no matter how they are cooked, or raw in many cases! I have learned so much from the new cooks about vegetables and the varied ways to cook them. You are awesome! I try to like eggplant but I just can’t! I love them all, for a few years I couldn’t stand beetroot and now is one of my favourite vegetables. As much as I want to like it, I could never snack on celery. But this looks delish! I would love a copy of Angela’s new book! This draws collective gasps but I just cannot get behind the potato! I love the skins but it’s just something about its texture and taste that I just can’t stomach. What’s even stranger is that I love sweet potatoes!!! I really dislike brussell sprouts! That attitude has softened just a bit as I used to hate kale, but now love it. So, you never know. Tastes can change in adulthood. I am willing to be pleasantly surprised. Ever since my mom used to cut up big chunks of green peppers in her tomato sauce, I have not been able to cook or eat them! Red peppers, good. Green peppers, YUCK! For me it’s celery. It just tastes like dirty water. And you usually can’t buy just one stick you have to get a huge bundle of it! If a recipe calls for it I will either leave it out or try to use very little. But, I can guarantee you will never see me ruining perfectly good peanut butter by spreading it on celery. I’ve never had a meat-based bolognese, but I’m sure it’s delicious if you eat meat. I’ve never really found myself not able to get behind a vegetable, but I’ve never made or been attracted to okra. My problem is okra – yuck! Learning to use more veggies and less meat in my diet, so your recipes are amazing. They help make the veggies delicious. Thank you, Kris. The texture of collards just doesn’t do it for me. I love this non-meat based sauce idea for veggie and non veggie eaters. So many mushroom possibilities. I can’t think of many vegetables I won’t eat but not a huge artichoke fan. Thanks for the new creations! Oh try it roasted, it’s so good! I just can’t do okra. I am the worst with squash. There is just something about it that’s just not right! I wish I liked eggplant. There are so many great recipes using it but I just can’t do it. It’s always been hard for me to get behind fennel but I recently had some grilled fennel and loved it so I may be warming up to the idea! Yes, grilled or roasted fennel is SO GOOD! Eggplant. It makes me sad to say that because I want to like it so badly – its so pretty! Every time I get it in my CSA I try to put it to use in a new recipe but, alas, I just never love it the way I want to. I can’t get into green beans, even though I’ve tried! No fresh tomatoes! Love ketchup, love tomato sauces, but fresh I just cannot do. Fennel! I just can’t get into it. Thanks for the chance to win! Ashley have you ever had fennel roasted? Mmm it’s my favorite – totally transforms! Oh that bowl looks so perfect! What a recipe! There are few foods that I don’t enjoy. Seriously, I have trouble thinking of one. I guess green peppers never really excite me (though charred on the grill isn’t a bad way to serve them). Purslane in my CSA. Tried it, didn’t like it. Thank goodness that was the last time it made an appearance. I just can not do beets, have tried them a few ways and just not a fan at all. There is only one veggie for me that I can’t get into – eggplant. No matter the amount of cheese or how it’s doctored up, I avoid it at all cost. All other veg is fair game, including mushrooms. This recipe looks awesome and so does the cookbook! Avocados. I’ll take them (grudgingly) in small amounts, not often. But I’ve tried for years to like them and nothing has changed. I can’t really get behind green beans either, even though I tend to get handfuls of them in my CSA. I guess I’ll just have to learn to love them (or pass them off to someone who already does). Eeek! I’d love to have her cookbook! I’ve been anxiously awaiting the publication for a while. I love her site and her recipes are always delicious! The only vegetable I can think of that I don’t particularly love is turnips. I also have a hard time with mushrooms! But, I think I could get behind them if they were diced small, too :) So excited to check out this book! Love all veggies, but my husband hates many of them, but especially mushrooms, so might sneak this one in to see how he responds. I am pretty equal opportunity when it comes to vegetables, but I can’t really get into beets. I just can’t do raw onions unless they are in a salsa. Go figure! This sounds delicious! I love mushrooms, so the more, the better. :-) I have a hard time with beets. I’ve finally come around to the golden kind when they are roasted (much more mild), but I still really struggle with the red ones. This book looks fantastic! Oh She Glows is consistently awesome! Honestly, its the eggplant. I want to love it, and often do in restaurants, but just can’t seem to make it work at home. It’s the texture I can’t get right. Excited to try this recipe! Personally I’ve tried to get on board with peas bur can’t! It’s the one vegetable I always omit if I see it listed. I am a vegetable loving vegetarian but for some reason I can’t get into portabello mushrooms. I feel like they are an easy cop out for restaurants or people who want to provide a meatless alternative to a burger. I really dislike the taste of cilantro or parsley in my green smoothies even though they are so detoxifying! I am not a huge fan of beets, though I would really like to like them! I made a soup with them one time that my boyfriend loved, but something about the texture and the earthy taste didn’t agree with me. Would love to give them another shot! Sherrie, this Bolognese looks so good! Thanks for your “more traditional” version, without the tahini, for a variation to include in my explorations! That pasta looks delicious and what a gorgeous book! I need! I have never been able to like tomatoes one bit. I don’t think it will ever change! I only can eat them in salsas or soups! Recently, I can’t tolerate eggplant. I’ve become quite ill after eating it. And it’s a shame, since I used to love it. I want to like eggplant so badly. This looks absolutely amazing. My husband has a lifelong aversion to lentils, but I feel like this might entice him to at least give them a try! My very favorite vegetable is brussels sprouts — roasted, always — which I think would be a perfect accompaniment to this dish! I really enjoy variety in my foods so I love them all. Yay veggies! I am so looking forward to Angela’s second book. I use her first all of the time. Love it all! Sounds like a great way to use vegetables – for this coming winter and beyond. Yum!! Rutabaga is the only vegetable I don’t like. I adore mushrooms, so this Bolognese looks perfect! I love the texture of lentils, it gives recipes that hearty taste that is tough to replicate is sauces like this! Gorgeously photographed here Sherrie, you are making me want to curl up with a plate of this as we speak. Enjoy this gorgeous book, I’m mega in love with Angela’s work too – and this book is no exception. ps. Loved that little factoid about your hubs! What a neat place to be from, and his family’s probably full of mouth watering Italian recipes too I’m sure! Radicchio. So pretty, but I don’t like its bitterness. I had broccoli at work every day since it was the only steamed veg in our salad bar. Now its hard for me to eat it. Maybe if I take a break from it for lunch for a while we can be friends again. 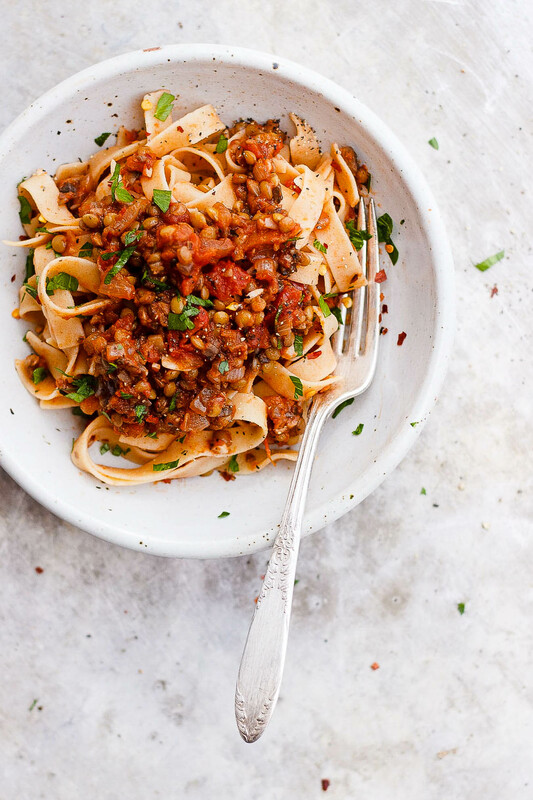 I’m such a fan of lentil Bolognese. It’s the plant-based family meal number one in my opinion. And Angelas book is a must have, I didn’t order it yet, but I sure will. You make it look so good too! This looks great! I love both lentils and mushrooms. I would love to win this book. Yum! This recipe looks great. I love most vegetables. Sweet potatoes are my favorite and lately I’ve been craving beets. Mushrooms are one food that I didn’t get on board with until college. The only vegetable I’ve turned my nose up on in recent years was purslane. My CSA would often tuck in in their box, but it was too hard for me to get excited about a vegetable that was also a rampant weed in my backyard! Okra, I can’t seem to prepare it right. I do like it when other people cook it though. I don’t think there are any vegetables I don’t like when they are prepared right! That being said, I screw up eggplant a lot! I like most vegetables, but can only handle fennel in small amounts. I have trouble eating okra. Would love to win this book. I love all vegetables! When I was a kid I couldn’t get behind eggplant. Now, as an adult, I love it. Especially in Indian cooking or in this vegetarian chili I make. So meaty and flavorful. I think I know what I’m making this weekend – haha. Parsnips and butter lettuce have weird textures for me. I enjoy the flavor though! I tried okra once and never went back. I love everything else. Eggplant and mushrooms are my favorites. Hi! I love Angela’s books and your blog. I avoid recipes calling for fennel – and they seem to be trending in lots of cookbooks/blogs! I admit I haven’t tried actually cooking with fennel root, I just think I don’t like the flavor. Maybe I should try it once then I’ll know for sure. I love so many other fruits and veggies, though, that I never get bored. Thanks! Christine roasted fennel is one of my favorite things! The flavors of the fennel really develop, and deepen and change in the oven. Try this one, I think you’ll be very pleasantly surprised! Tomatoes. I used to love them as a kid, but now there’s too sweet, and I don’t like the slimy seeds. It would be eggplant for me! Too oily and mushy. I’m not a huge fan of eggplant. I don’t like the consistency or its skin. Celery! Yuck. Also not a fan of cooked peas, but I love snacking on them frozen. Eeeeek kohlrabi! Someone help a sista out and help me appreciate it. It seems like aaaall the hip food bloggers are doing crazy things with it but it’s just not my thing! I don’t love zucchini or eggplant! I really try to like brussel sprouts, and the recipes I see look delish, but I just can’t wrap my taste buds around them. Maybe one day? Keeping fingers, toes, and paws crossed over here. I never met a vegetable I didn’t love! It’s all about how you prepare them- even the ones most people hate can be made delicious, at least in my experience. I would have to say artichokes. I have no idea what they taste like nor how to prepare one. I hate olives of any kind. It’s so sad! I hate disliking food. This Bolognese sauce is the recipe I’ve been waiting for. I can’t wait to try it! I really love pretty much all vegetables but, I don’t know what to do with okra. I love most vegetables, but I am not a big fan of asparagus. I don’t mind it grilled. Peas. It has always been peas. Eggplant? Awesome. Zucchini? Delicious. Peas? No thank you. I like red, orange and yellow peppers but can’t stand the flavor of green peppers. Raw onions. Love the taste as I’m eating them but not hours later, on top of dessert! I struggle with eating as much greens as I should. I’m good with kale but can’t really get behind Swiss chard or mustard greens. Thank you for the chance to win Angela’s beautiful new book!! I almost laughed when I read about you hating mushrooms, I’m the same way! Everyone is always shocked that I’m a vegan who hates mushrooms, in the vegan/vegetarian world they’re such a common ingredient. I will have to give this bolognese a try to see if I can tolerate the mushrooms. Like you, I’ve tried and tried countless times, and I just can’t get them down. Olives are next on the most hated list. Besides the two, I love all other plants. Delicious! Very hearty and substantial. I used all the optional ingredients except I used conventional parm as well as tagliatelle that wasn’t gluten-free. I’m a solo cook, so this recipe made a lot and gave me a lot of leftovers, another plus.